What's The Best Way To Help Farmers In Uganda With A Nightmare Foot Disease? : Goats and Soda It was a mystery: How did farmers in Uganda contract a nightmare illness? A researcher found the answer. What's the best way to help them? The typical asymmetrical lymphedema (lower limb swelling) seen in podoconiosis. The skin on the affected limbs is thickened with warty and mossy nodules. The toes are disfigured with joint fixation typical of advanced podoconiosis disease. 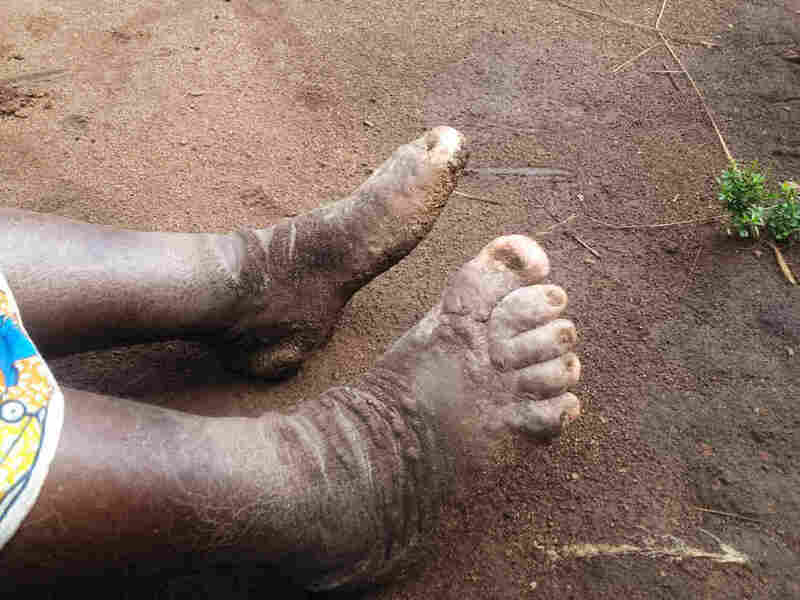 A number of farmers in Uganda are suffering from a nightmare illness, in which their legs, feet and toes swell up so much that they can't walk. The skin thickens and breaks open, creating ulcers and infections. A researcher found the cause. What's happened since then? At the end of the story, we described a simple way to stop progression of the disease and prevent the problem in the future: Wear shoes while working in the fields. Goats are curious animals and "Goats and Soda" is a curious blog. Over the next week, we'll be looking back at some of our favorite stories to see "whatever happened to ..."
Immediately many readers wanted to help. They emailed, tweeted and commented on Facebook with one unified response: How can I help get shoes to these farmers? For an update, we called one of the world's experts on podoconiosis, who has dedicated her career to stopping this disease. "In 2002, I met a 16-year-old girl in Ethiopia, who had tried to commit suicide a couple of days before because her foot had begun swelling," says epidemiologist Gail Davey of the Brighton and Sussex Medical School. "The girl knew the huge stigma that would be on her because she was developing podoconiosis — that she couldn't marry, couldn't go to school," Davey says. "And at the time, she thought there was nothing that could help. So she tried to kill herself." That moment was a turning point in Davey's career. "Her story hit me very hard," Davey says. "Knowing that the Ethiopian government wasn't doing anything formally about podoconiosis, I just realized somebody had to do more." She started working with nongovernmental organizations in Ethiopia and eventually launched Footwork, a nonprofit focused on treating and preventing podoconiosis. The group has tried out a bunch of strategies and approaches in Ethiopia, including giving shoes to families. She has even teamed up with TOMS shoes — which promises to give a pair of shoes to someone in need for each pair of shoes purchased. "What TOMS has done is absolutely brilliant," Davey says. "They've arranged and paid for the distribution of millions of shoes for children to prevent many diseases, including podoconiosis." But giving away a pair of shoes isn't enough, Davey says, for preventing this disease. For starters, it's not a sustainable approach. There are more than 40 million people at risk for podoconiosis around the world. And shoes wear out. Kids grow out of them. So one pair of shoes per person isn't going to stop podoconiosis from striking. "This isn't a one-off event," Davey says. "For children, shoes need to be changed at least yearly." Plus, if you give shoes to people who have never worn shoes before, they don't just pop them on their feet because some foreigner says to. Put yourself in their situation for a moment. If an outsider came to your house and told you to put on some crazy-looking knee pads, would you automatically wear them? "It's quite difficult to convince some people in the U.K. or the U.S. that some people may not see a reason to wear shoes," Davey says. People also need to know why they're receiving the shoes. "In our experience, they need information and education about podoconiosis and how the shoes will help," she says. So Davey has shifted her efforts away from simply giving away free shoes. Instead, she is focused on teaching farmers and their families how they can take care of their feet and prevent podoconiosis. There's one simple step: Washing the feet with soap and water each day. Scientists aren't exactly sure how the volcanic soil triggers podoconiosis. One hypothesis is that silica — or some other mineral in the soil — creates tiny slices in the skin and makes its way into the lymphatic system. Then the immune system attacks the mineral, creating a massive inflammatory response that eventually damages lymph vessels. So if you remove the soil from the skin, you can prevent podoconiosis from developing. The method can also ameliorate the disease once it's already taken hold, Daley says. "We recently completed a trial — which isn't yet published — that shows simply washing your feet and then wrapping them with bandages, socks and shoes does lead to an improvement," Davey says, "both in the physical changes caused by podoconiosis but also in the very disabling acute attacks that happen weekly or monthly." Once people see what a difference washing and covering their feet can make, Davey says, they are more likely to put shoes on their shopping lists. "So they buy shoes when they buy clothes," she says. "That's the direction we're moving in Ethiopia, where there's quite a strong resistance to dependence on gifts from other countries." Davey and her team haven't started working in western Uganda, where researchers just realized podoconiosis is a problem. But she hopes to start soon. "We're preparing to map out where the disease occurs in Uganda," she says. "And then we are also looking at scaling up these interventions that we know work in Ethiopia." In the meantime, if readers want to help, Davey suggests that they make it clear to their representatives in Congress that foreign aid for projects that tackle neglected diseases, like podoconiosis, is worth the investment. "Let political representatives know that podoconiosis is an important problem in other countries that needs to be on the government's radar," she says. "And instead of giving away shoes, I think the best way to help is to give to programs that teach people how to take care of themselves." Readers, are there other Goats and Soda stories you'd like for us to follow up? Tell us using the tool below. Make sure you include the story link and share a little about why you'd like to get an update. We'll see what we can do! Our submission form is now closed. Thanks for participating!